The 287th Quartermaster Company, Special Troops Battalion, 3rd Infantry Division Sustainment Brigade activated during a ceremony Feb. 20, 2019 at Ft. Stewart, Ga. The company is the fourth one to activate as part of a new Army initiative to consolidate field feeding assets for ease of garrison, field and deployed culinary support. The 287th QM, also known as the Field Feeding Co., is responsible for manning the dining facilities (DFACs) on Ft. Stewart and Hunter Army Airfield, Ga., the Culinary Outpost Kiosk, food trucks and providing teams of culinary specialists for training exercises or deployments. 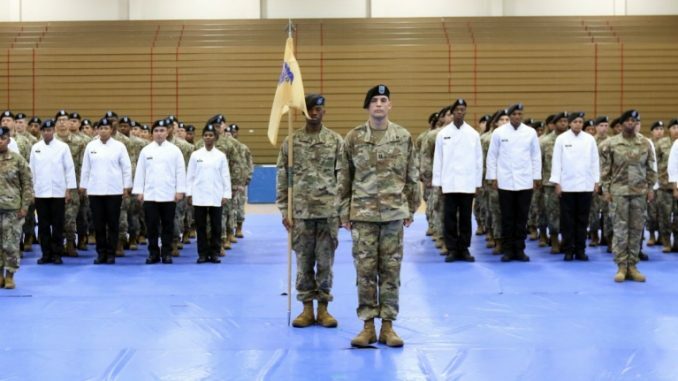 It consists of approximately 140 culinary specialists (92Gs) that make up eight field feeding teams that rotate between garrison DFACs and field training operations. By having all of the 92Gs under one roof, unit leadership can create training that caters specifically to their Soldiers’ needs. With the creation of the field feeding company, cooks in the division are organized and trained feed dog face Soldiers whether they are in garrison, field or deployed environments. The Military Provisioner is designed as an information portal for those working in Military Food Service worldwide.